Meet Isabella, she's a Libra. Izzi’s theme is classic “roadtrip”, designed by Shawn Wolfe. She’s dropped anchor in Boston, Massachusetts, making the scene and spreading the Pacifico lifestyle in merry old New England. Nice integration of doombuggies in baja on top of a VW bus. Nice one! Love this bus. Shawn Wolfe always does great work. This was painted by DC Signs & Graphics of Lake Tapps, WA. Where/when can I find Isabella in Bean Town? I love myself some Pacifico! Great artwork! 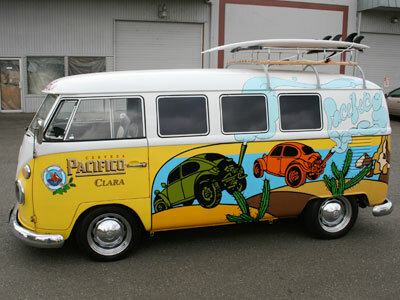 I wanna get on for the ride and help spread the Pacifico Clara gospel. Experiential marketing is my gig!